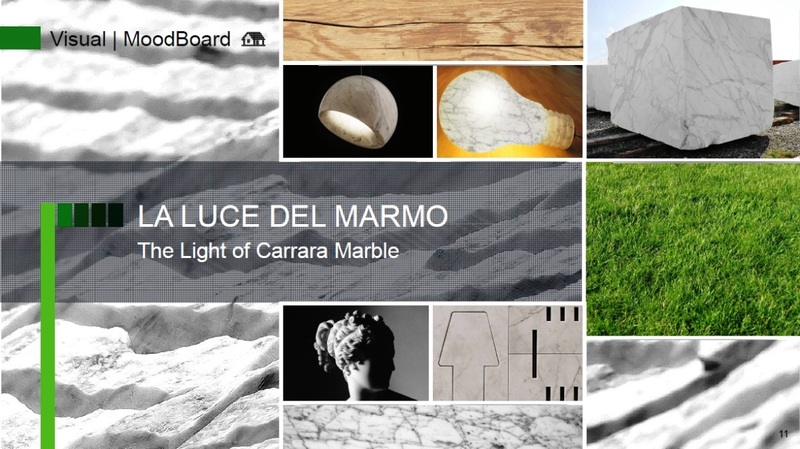 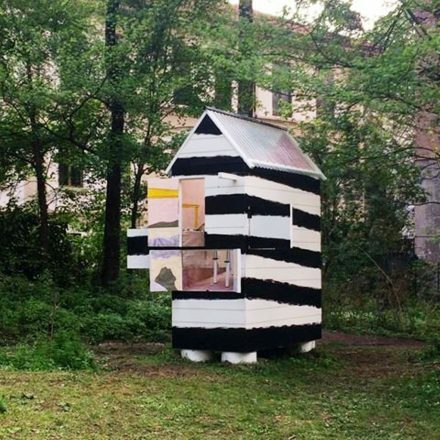 This was an initiative of IMM ( Internazionale Marmi e Macchine S.p.A ) for the promotion of the Carrara Marble District and was made in partnership with Looping, creative and consulting agency, under the artistic direction of Angelo Dadda, and was supported by Comune di Carrara and ADI – Association for Industrial Design. 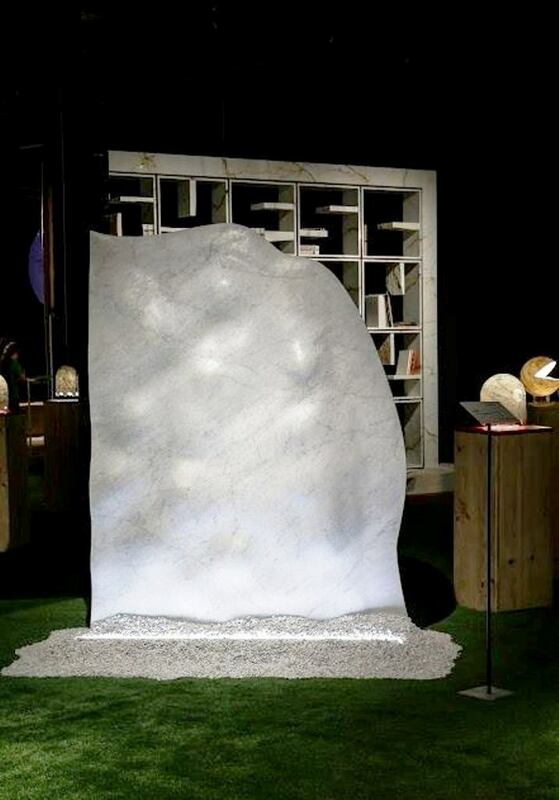 The event was a unique opportunity for the Marble quarrying companies of the Apuoversilies district ( just South of La Spezia on Italy’s west coast, to present to the international public through a design story which enhanced the “marble” material but above all showed the technical and creative skills of the use of the Artisans who designed and produced objects from this beautiful raw material. 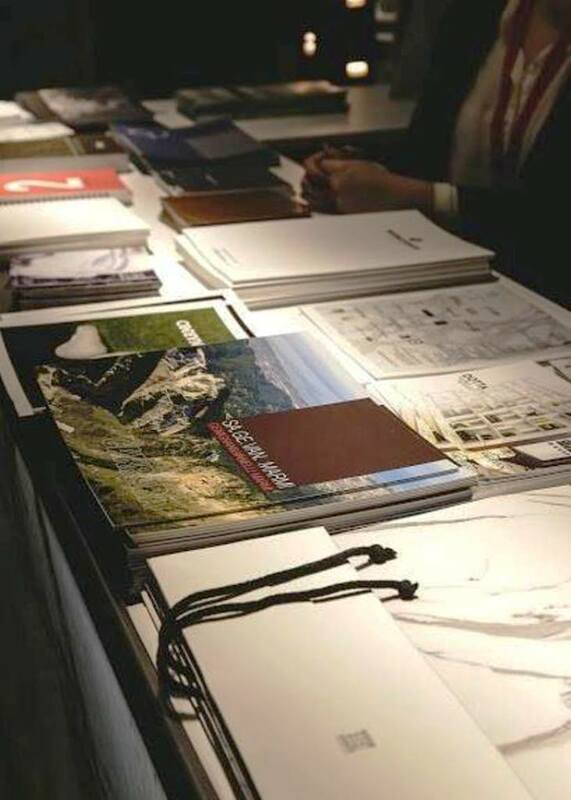 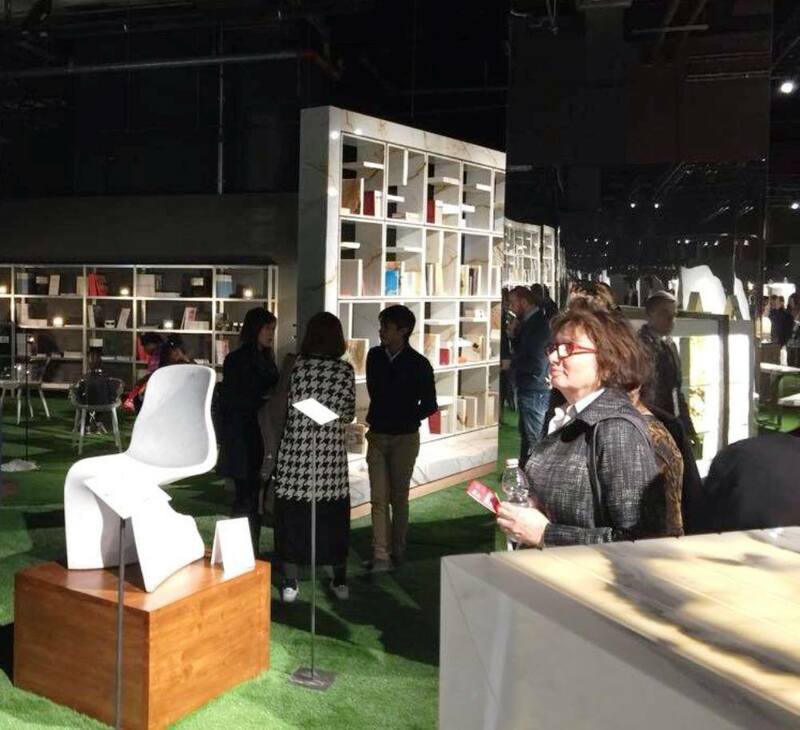 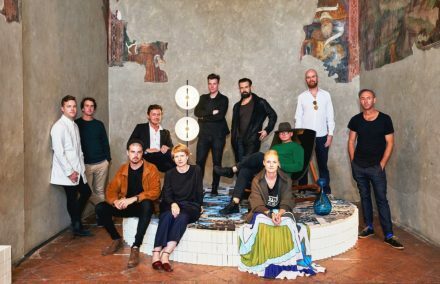 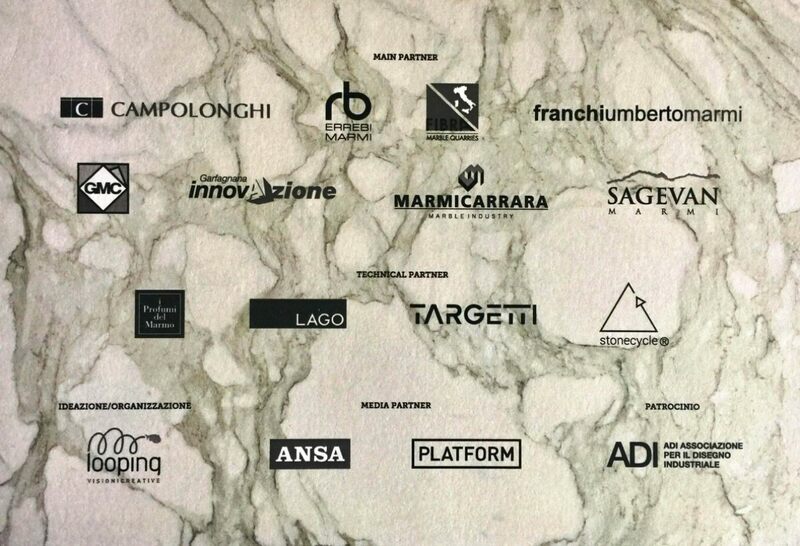 The initiative, curated by IMM in partnership with creative advisor – Looping Consulting agency, promoted Carrara’s marble brand and ensure partner companies have the right contacts with the world of design and architecture Internationally. 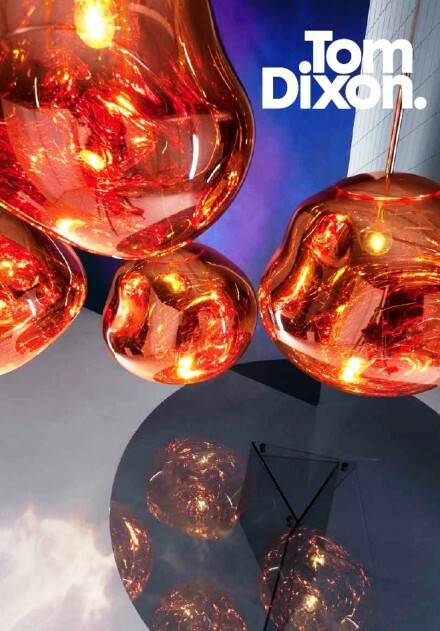 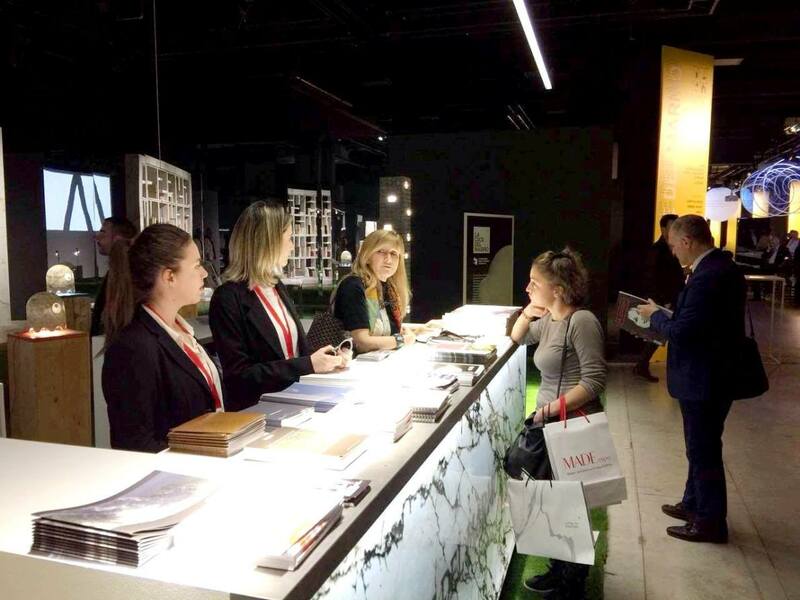 3) Light as an element of material and shape enhancement, consistent with the simultaneous presence of Euroluce at the Show. 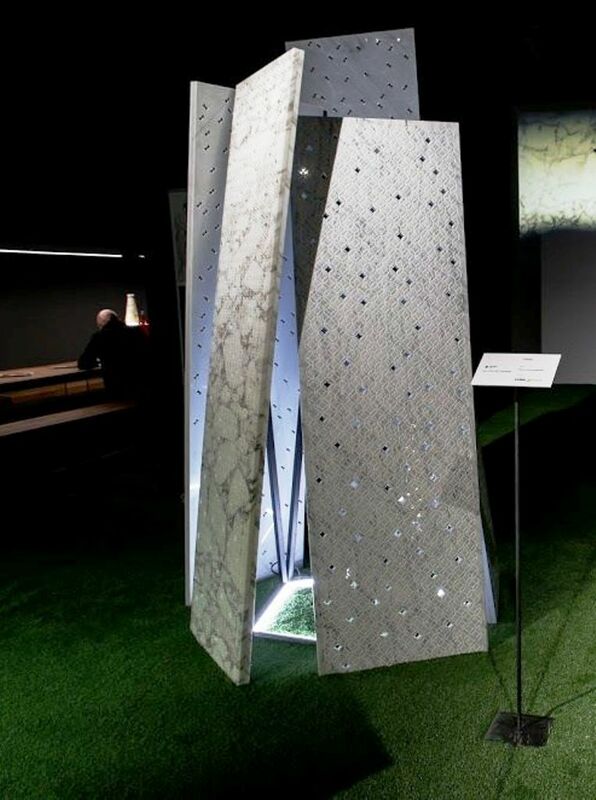 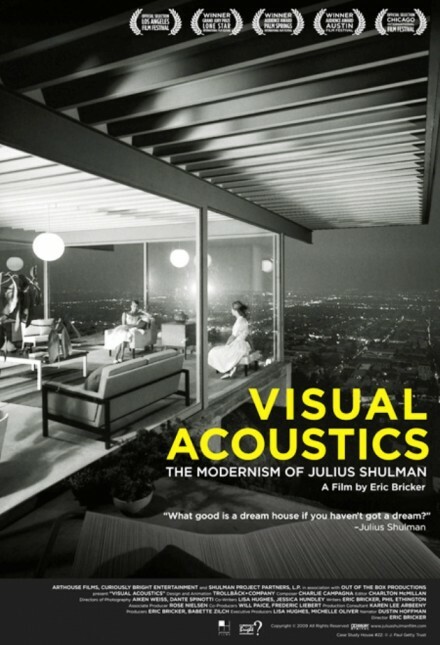 As well as a large projection screen on which were shown representative films of quarries and processing works that transform raw material into refined artifacts that the whole world envies. 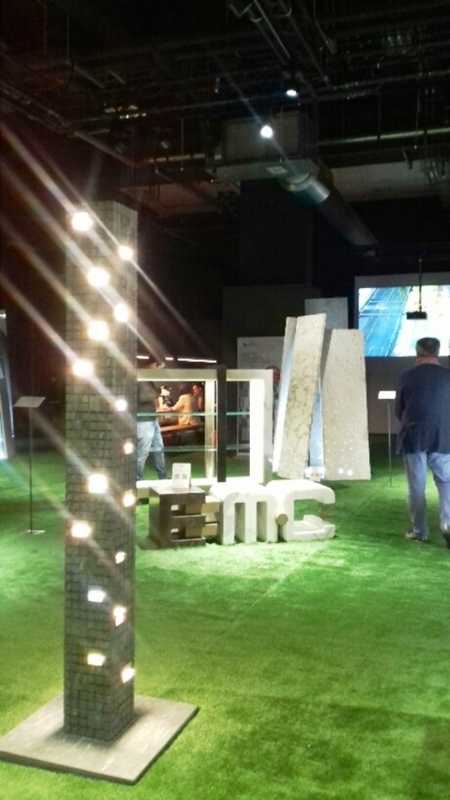 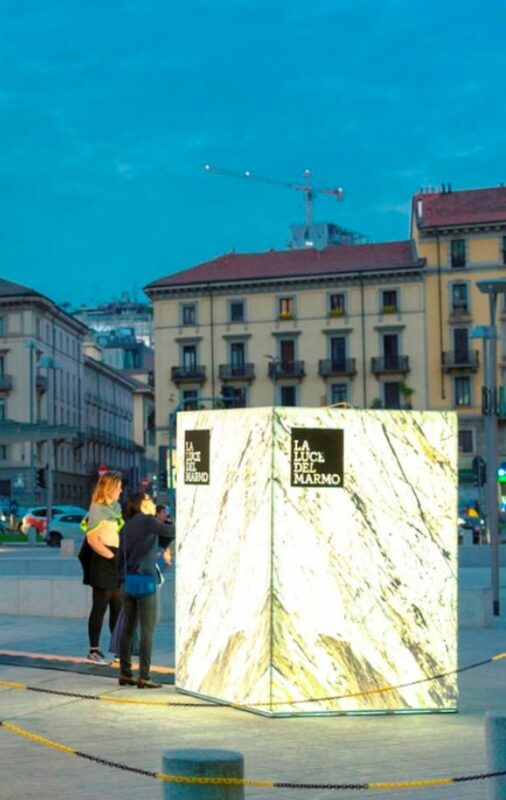 The entry Symbol of the exhibition was the monolithic ” Block The Rock “, an imposing Carrara marble block of cleverly illuminated interior that was placed on the square in front of the entrance. 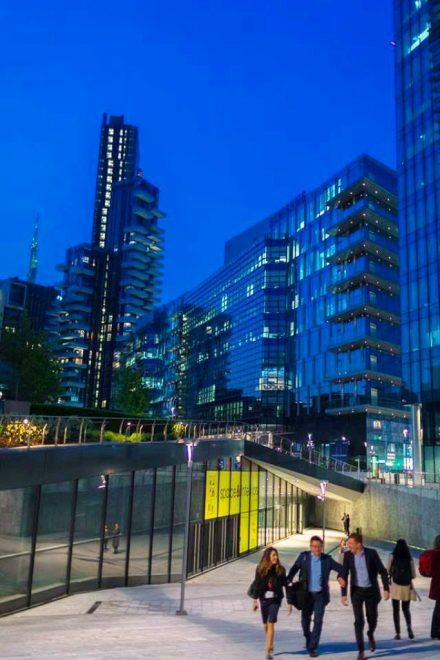 Turned off by day, it came alive in the evenings shining of its own light and become a massive lantern among the buildings of Pota Nuova. 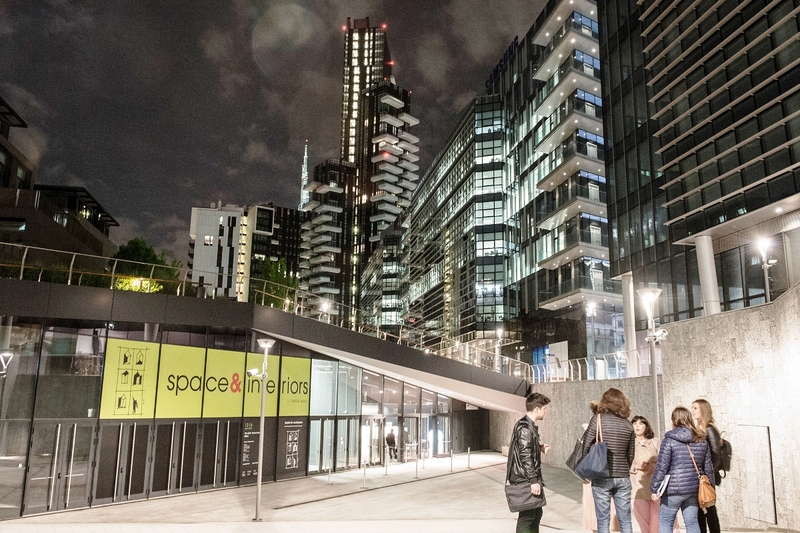 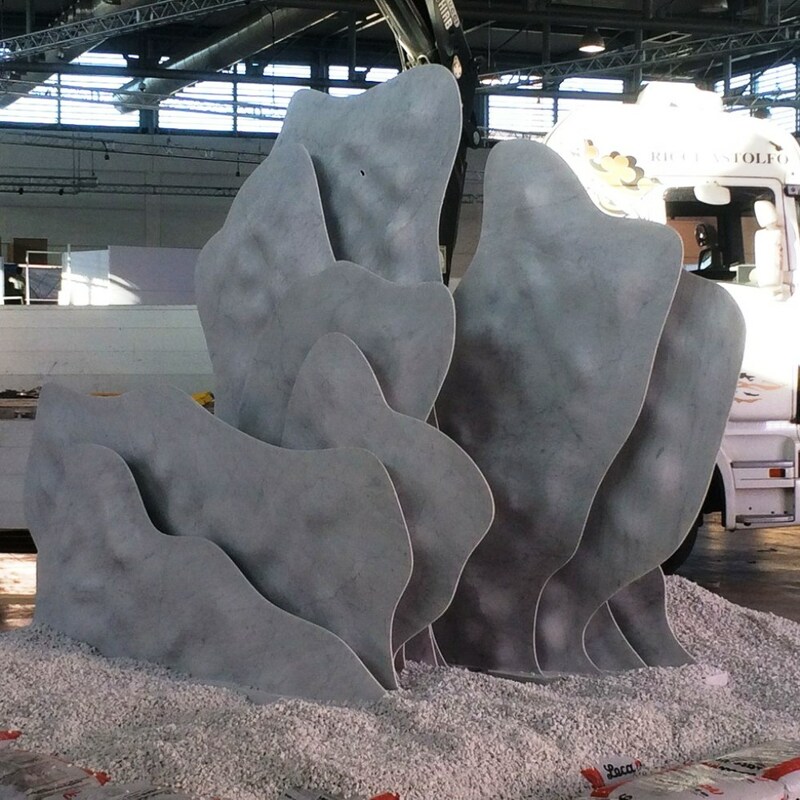 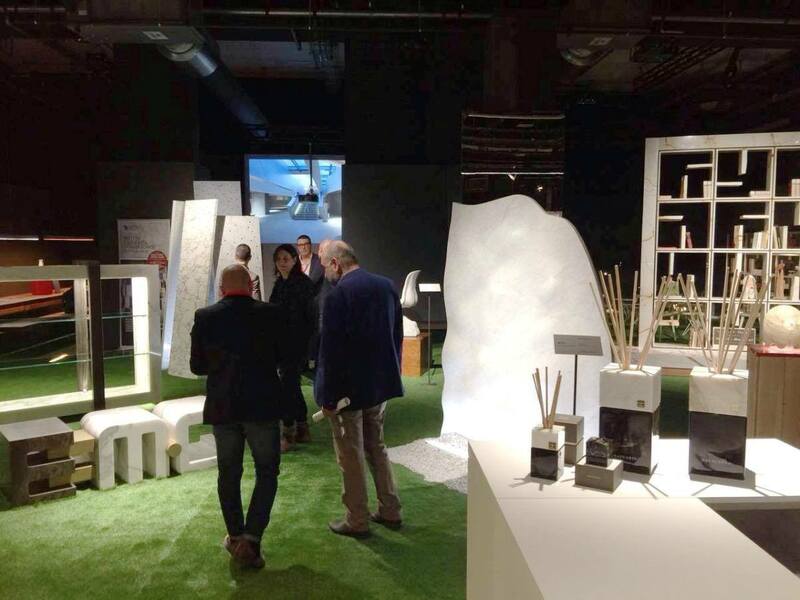 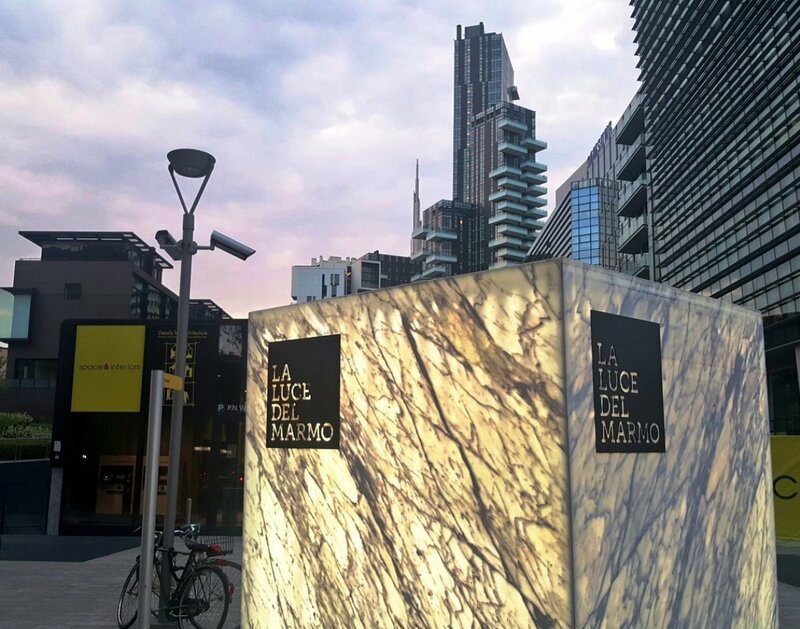 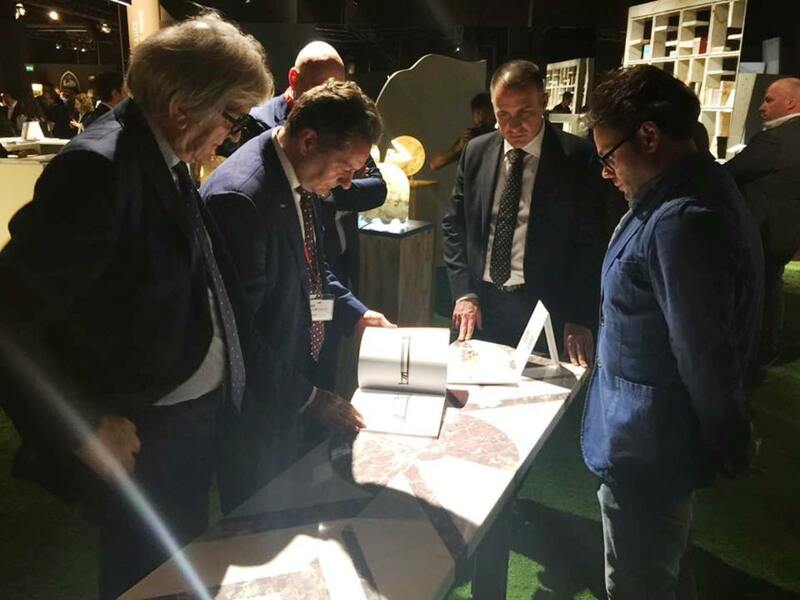 The choice of location at The Mall in Porta Nuova, Milan allowed the story of Carrara marble to be brought to international professionals through a natural design dialogue, starting from the fruitful collaboration with the designers involved in the project, to the many meetings with the world of Professionals expected at the Milan fair. 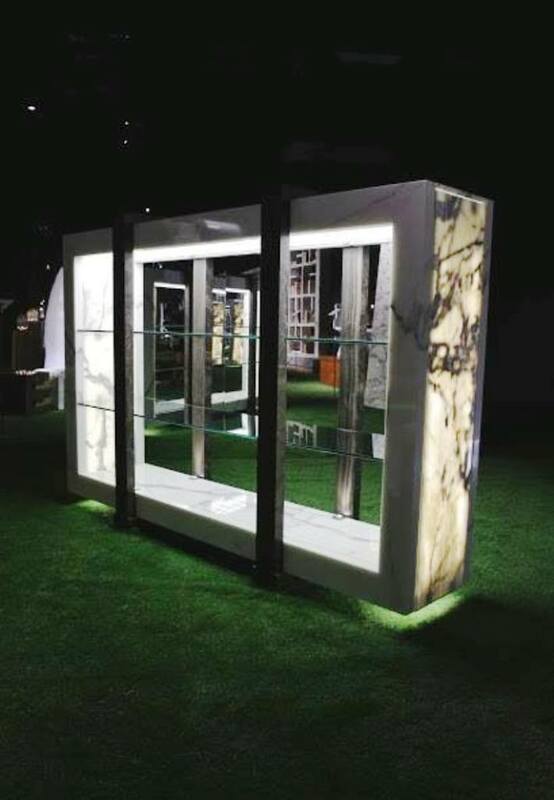 “ We chose a highly qualified and impressive location within the Space & Interiors container because our marble deserves a top-level stage and at the same time partner companies want opportunity is not only a communication operation but also a time of business development for the world of design professionals at international level. 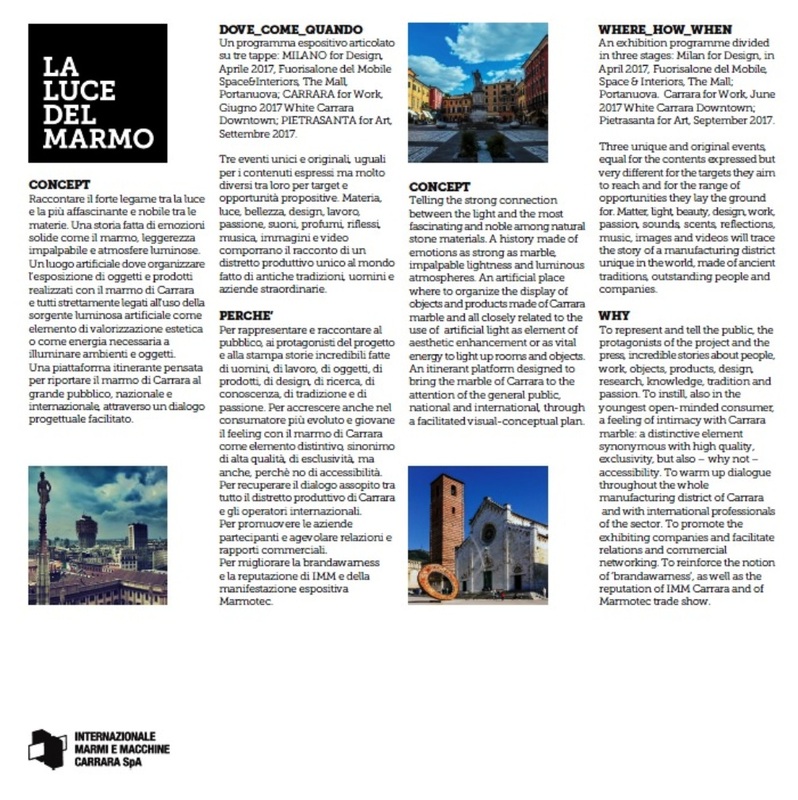 The communications and promotions plan implemented by IMM Carrara, under the artistic direction of Angelo Dadda (Looping) and sponsored by ADI (the Industrial Design Association) and Carrara Municipality, focussed on the themes of light and lightness applied to marble, in a kind of museum tour created by the eight participating companies: Campolonghi, Errebi Marmi, Fibra, Franchi Umberto Marmi, Garfagnana Innovazione, G.M.C. 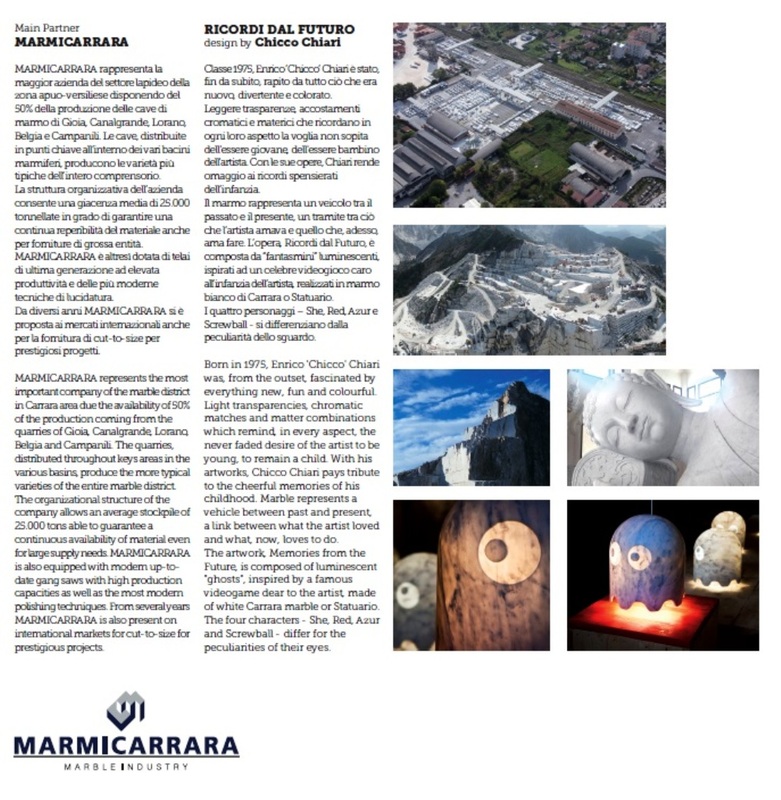 Graniti Marmi Colorati, Marmi Carrara and Sa.Ge.Van. 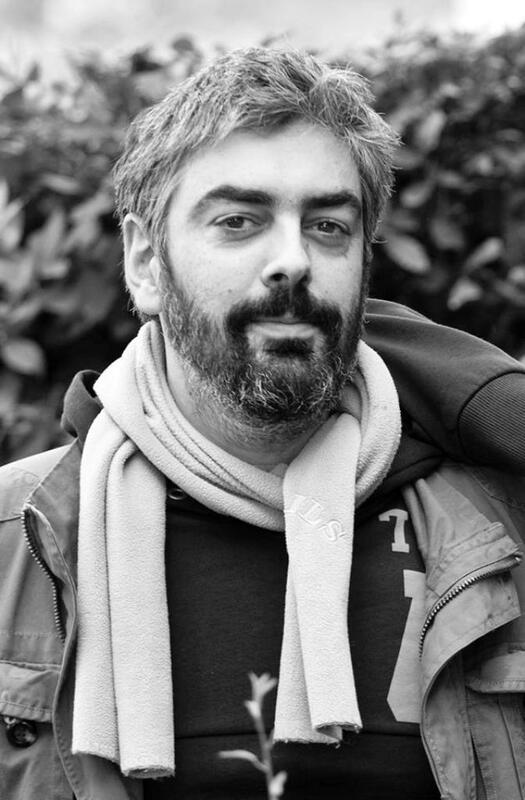 Marmi. 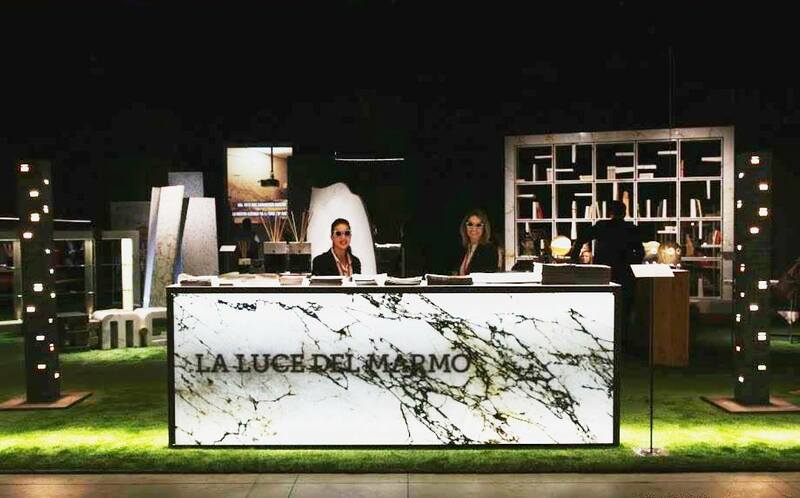 The companies, collaborating with important designers, showed marble with art and passion, creating works and products of great visual impact for the occasion. 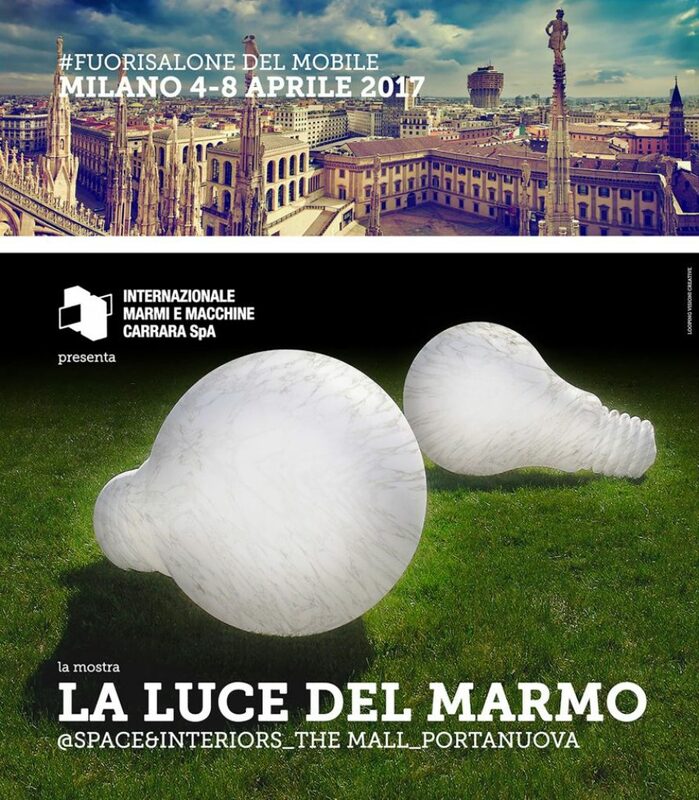 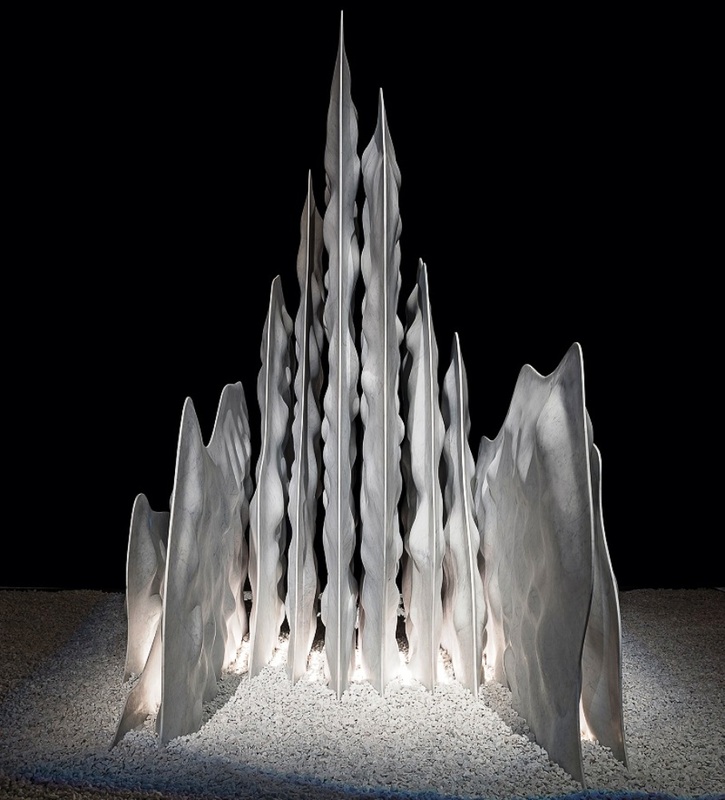 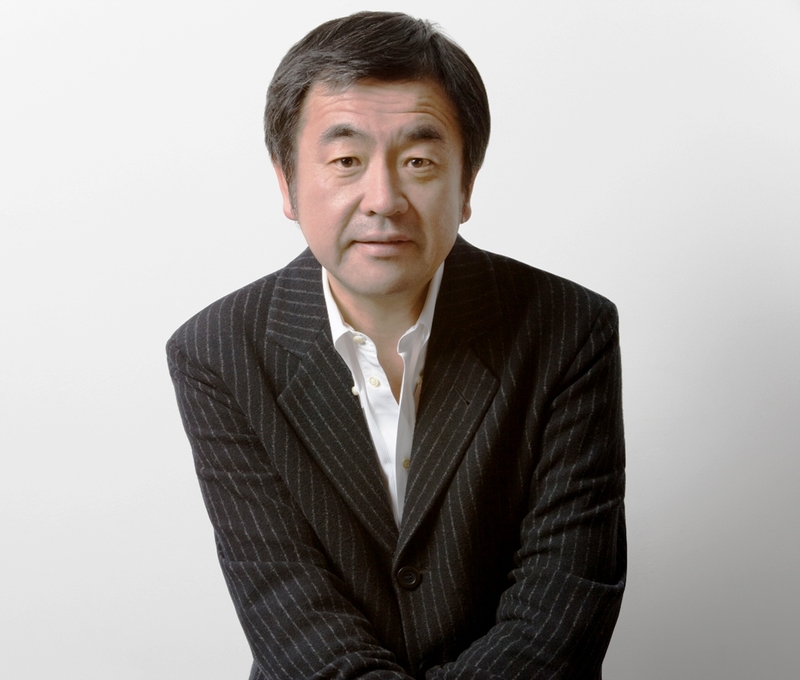 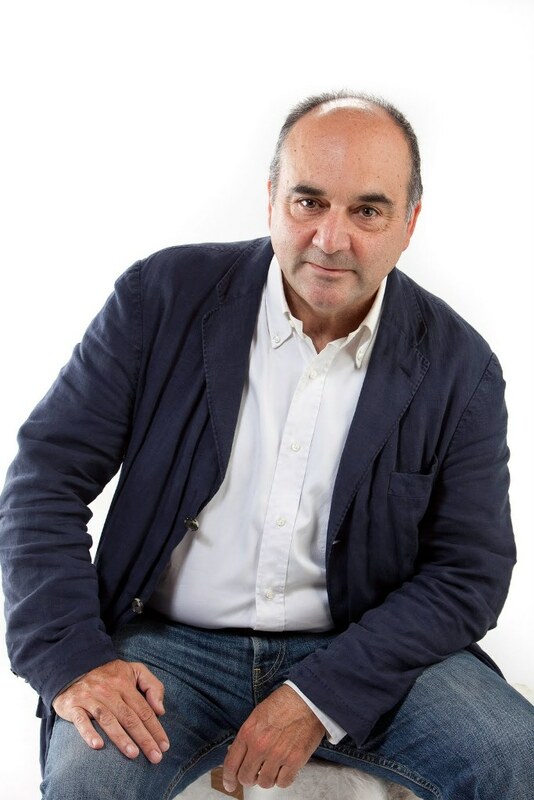 Among them, the Japanese architect and writer Kengo Kuma – founder, in 1990, of the international studio Kengo Kuma & Associates and famous master renowned for his ability to wisely interpret the concept of lightness related to natural stone – will present with Franchi Umberto Marmi the art installation Erodescape. 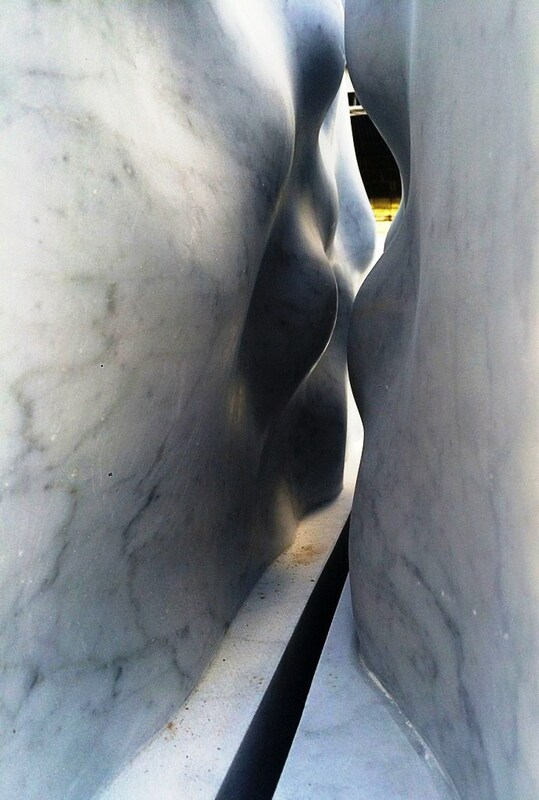 Erodescape seems to have been shaped all over the centuries by the slow erosion caused by natural elements, such as water and wind, and not by the sophisticated processes with which the surfaces have been actually sculpted”. 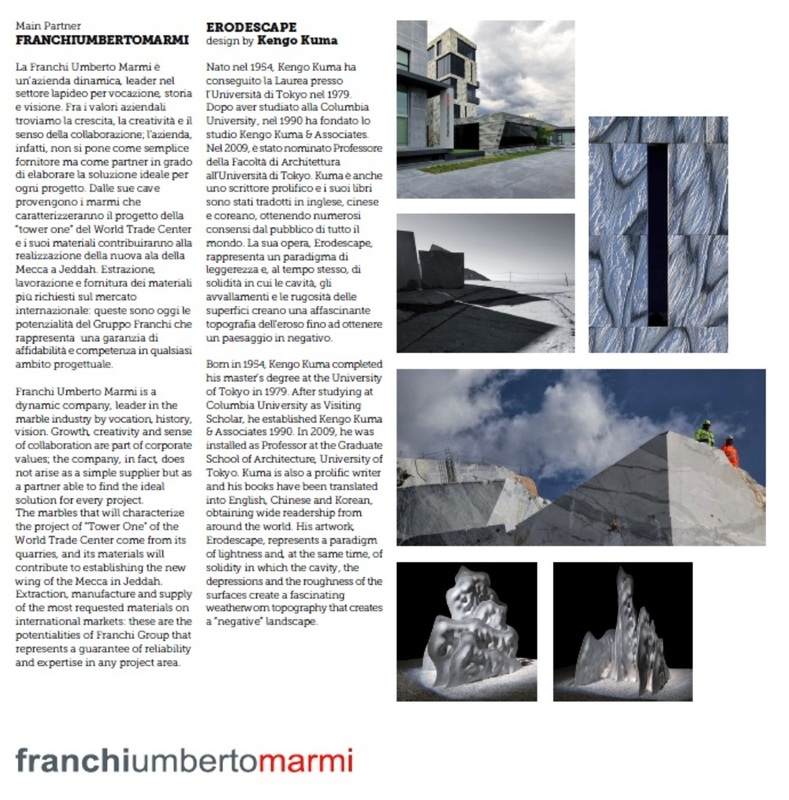 Franchi Umberto Marmi is a leader in the marble industry – from its quarries come the marbles that featured in the design of “Tower One” of the World Trade Center and its materials will contribute to the creation of the new wing of Mecca in Jeddah. 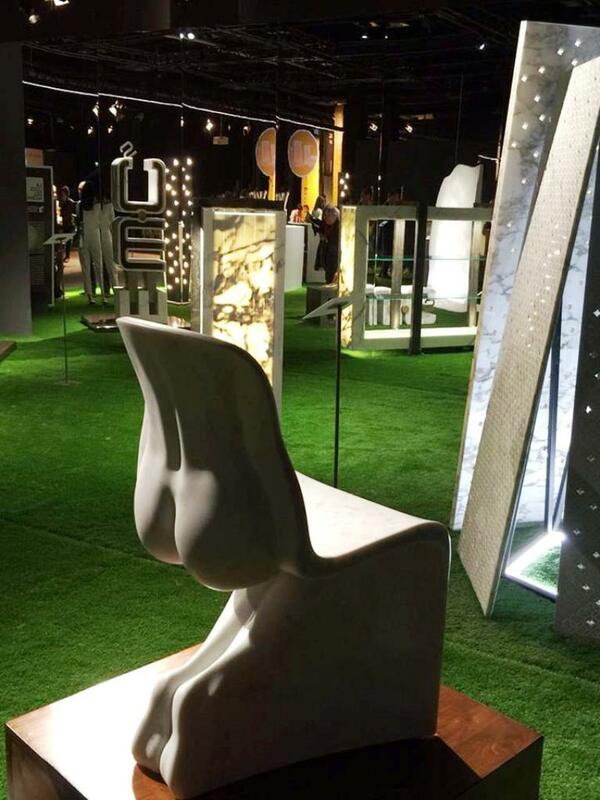 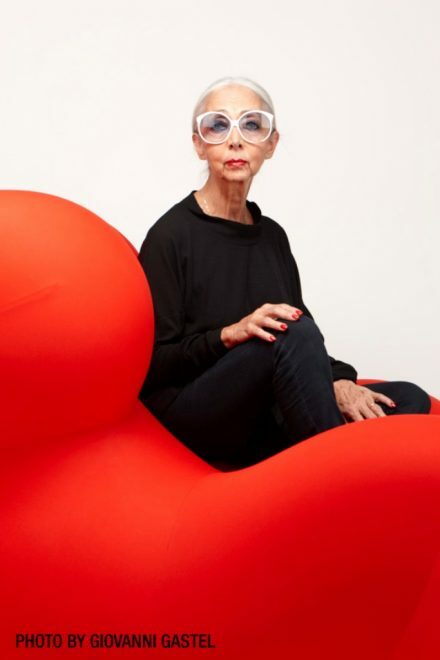 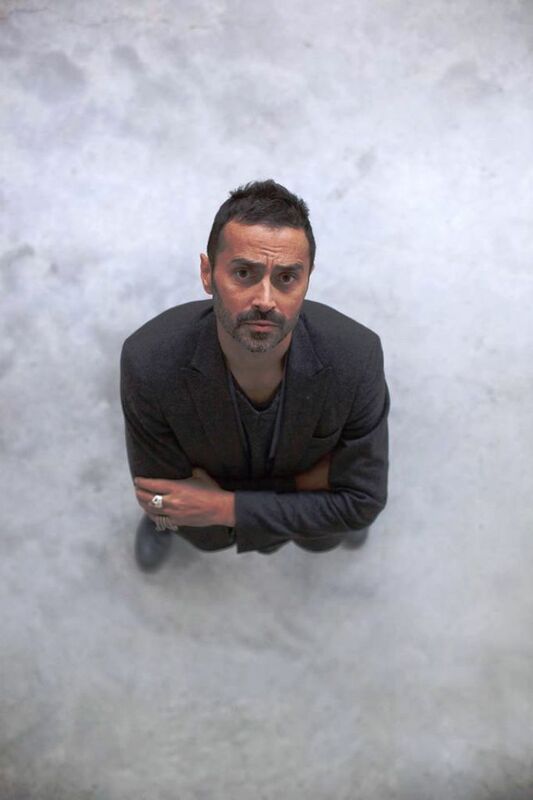 Fabio Novembre, a world-renowned architect for his visionary approach to natural stone, in partnership with Campolonghi, has reinvented HER, the iconic anthropomorphic chair by Fabio for Casamania that celebrates the beauty and the elegance of the human body. 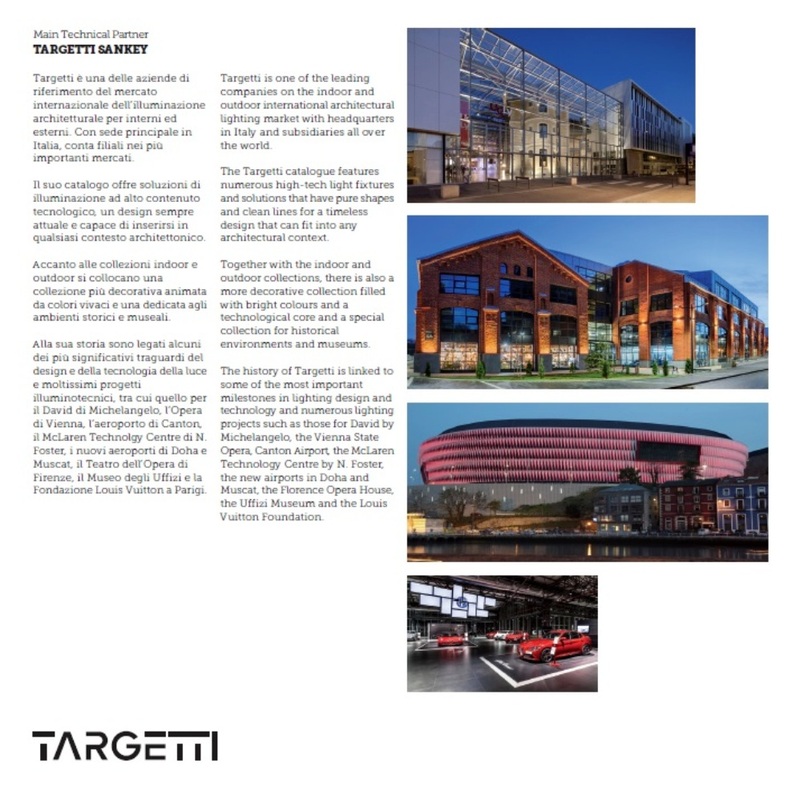 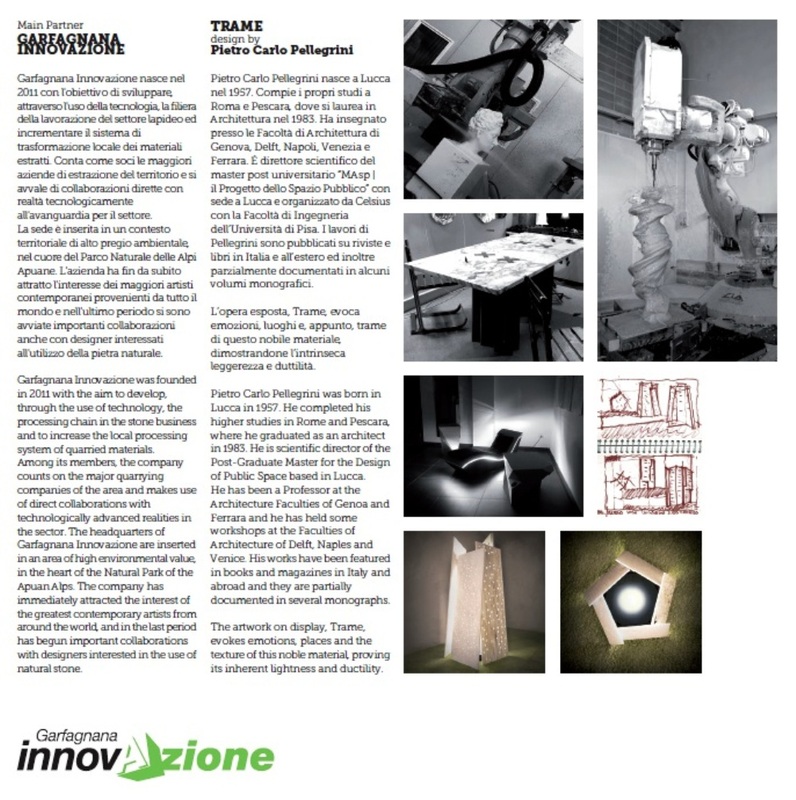 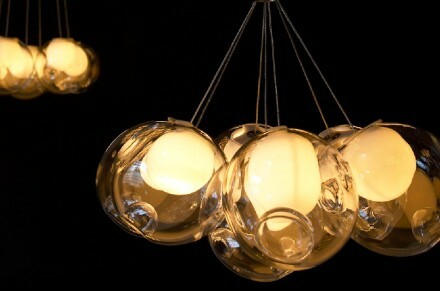 Trame, the project by company bearing the signature of architect Pietro Carlo Pellegrini, will recall emotions, places and “trame”, in the sense of experiences connected to this noble material, in a way to show its intrinsic lightness and plasticity”. 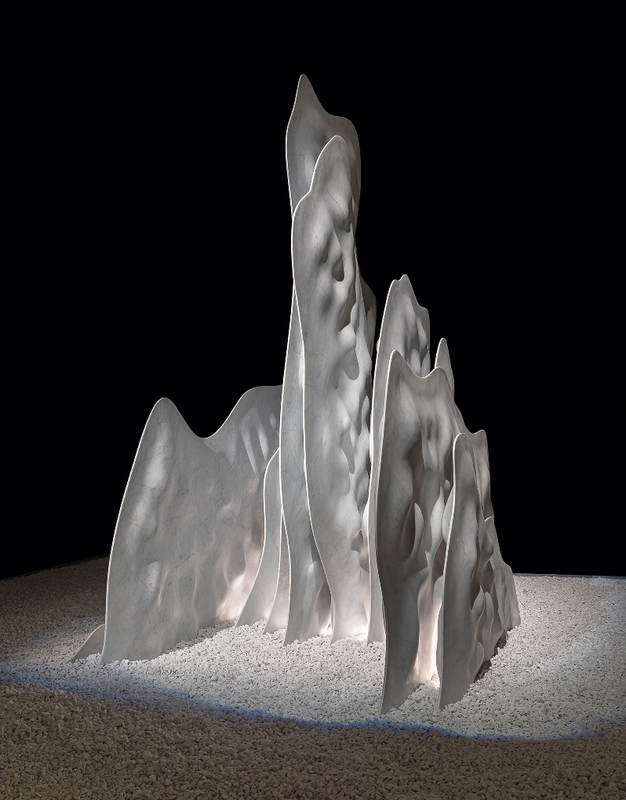 The exposed work, Textures, evokes emotions, places and, precisely, plots of this noble material, demonstrating its intrinsic lightness and ductility. 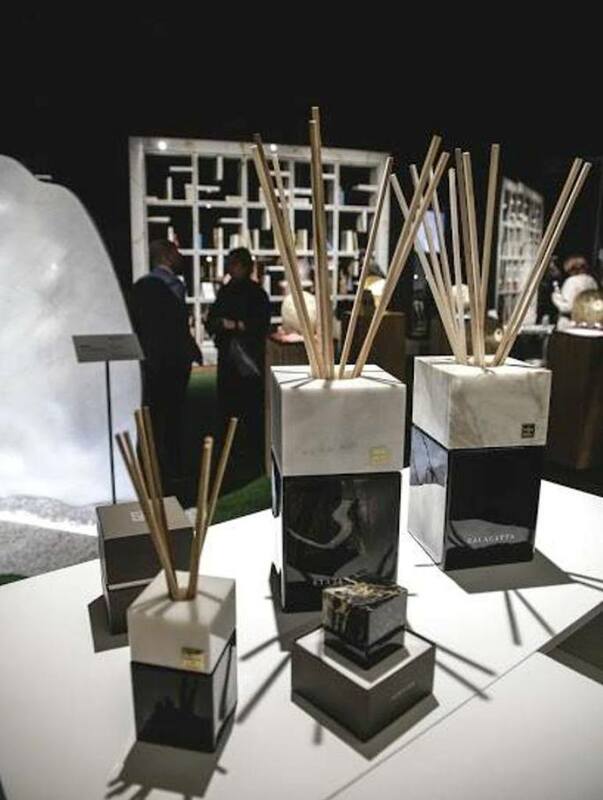 Errebi participated with two products –Einston and Legaccio – created by the designer Nicola Venutelli. 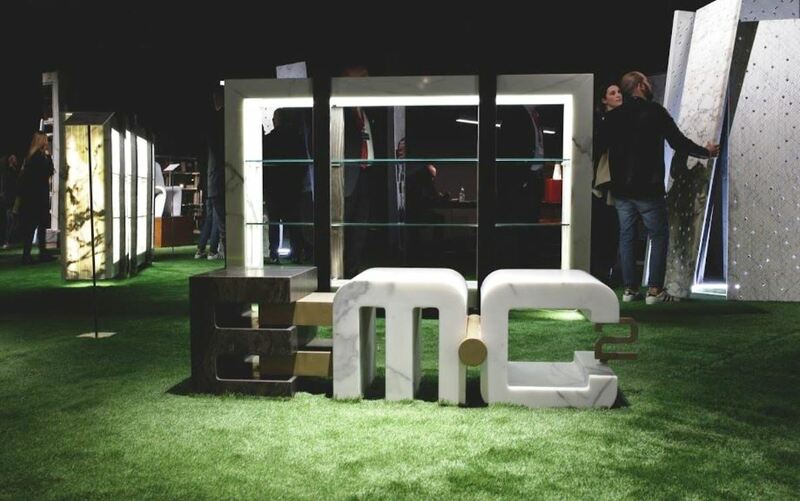 In the first work, Einstein, energy and matter intersect, just as in the formula of Albert Einstein, summing up the essence of the world. 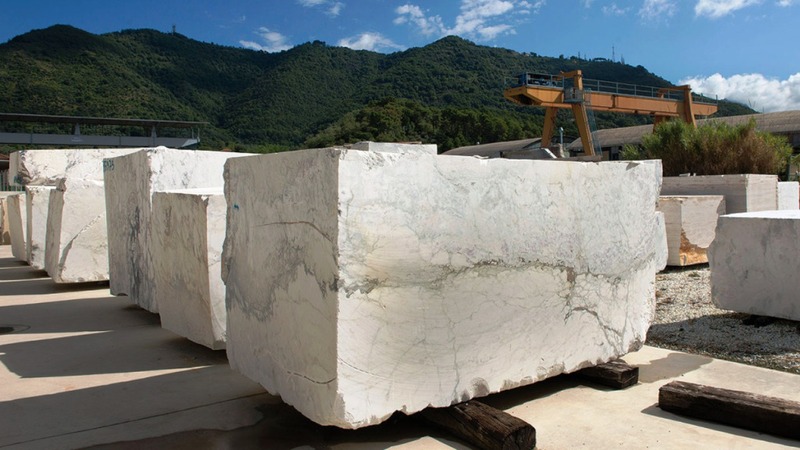 Almost by natural vocation, activity has developed from the beginning of the raw material and has grown over the years thanks to the constant search for new marbles – such as Tobacco Brown, also known as Eramas – and the rediscovery of ancient marbles Italians – for example the Calacatta Cielo, the Calacatta Aurora, the White Lunezia and the CalacattaLunae. 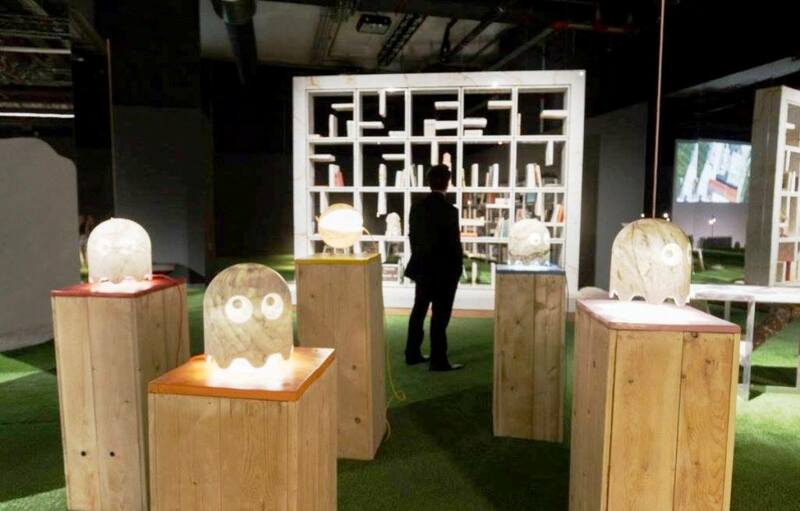 The modular bookshelf Dotta by Sa.Ge.Van. 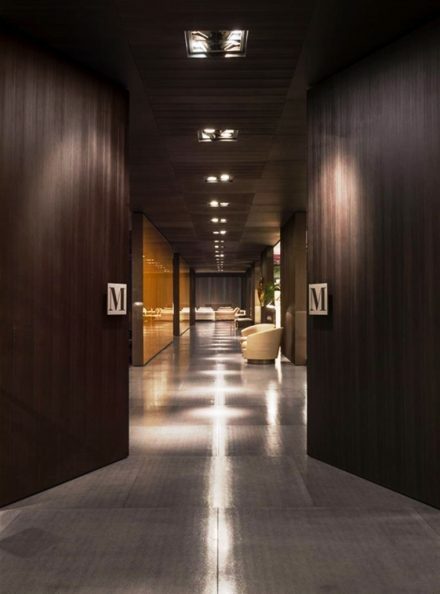 Marmi was designed by Diana Pelaez Cialdini and Franco Gemignani. 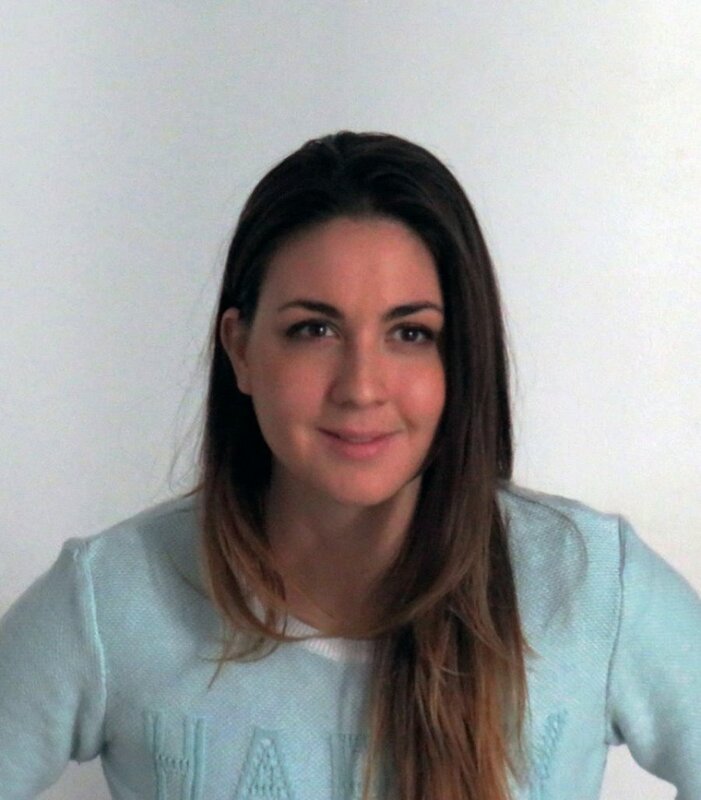 The young Mexican architect Diana Pelaez Cialdini ( born in 1988 ), collaborated with Franco Gemignani, Sa.Ge.Van. 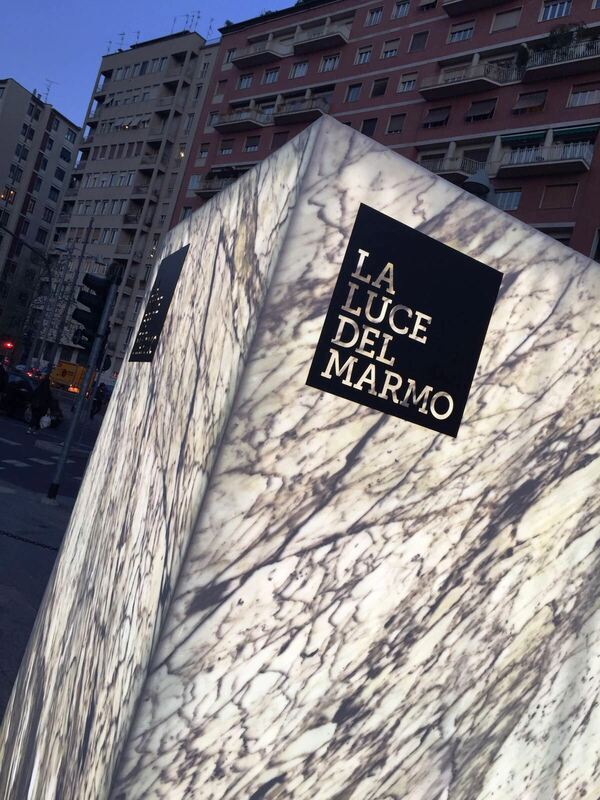 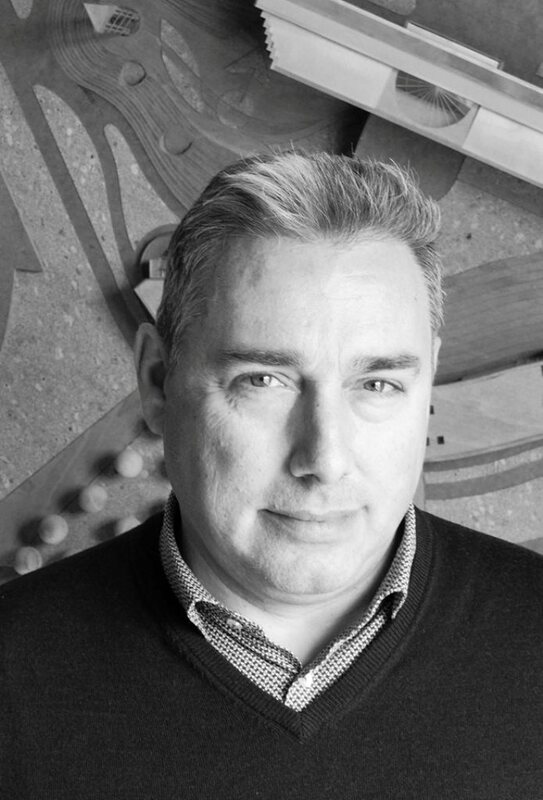 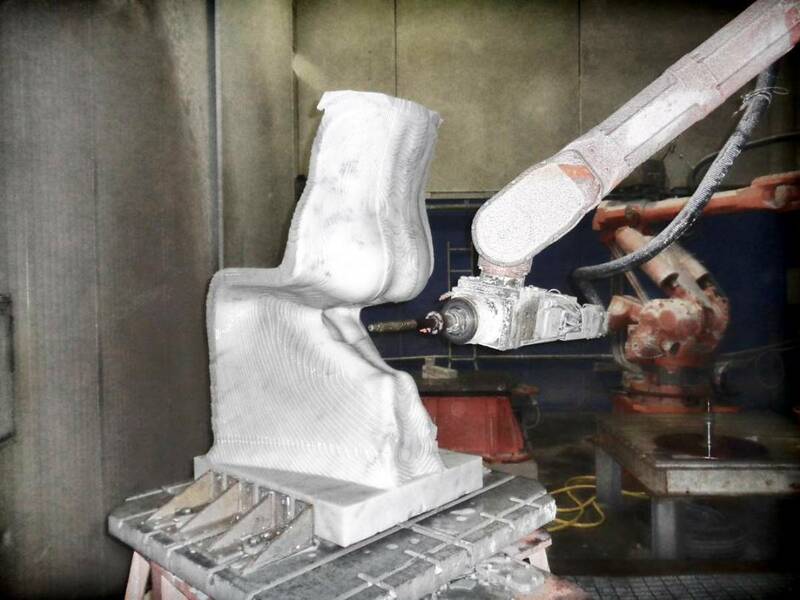 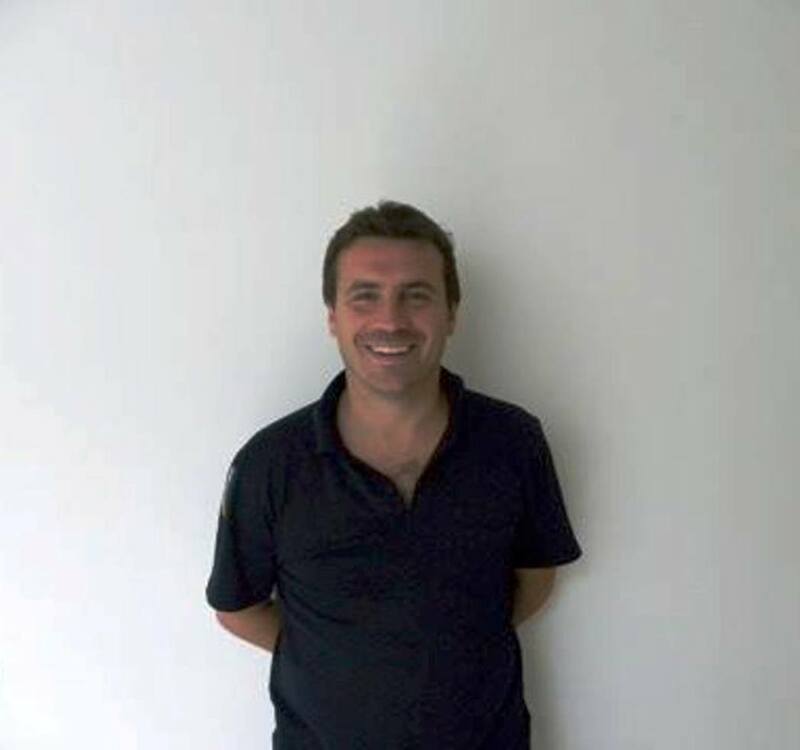 Marmi technical director, to develop architectural and design elements entirely made of marble. 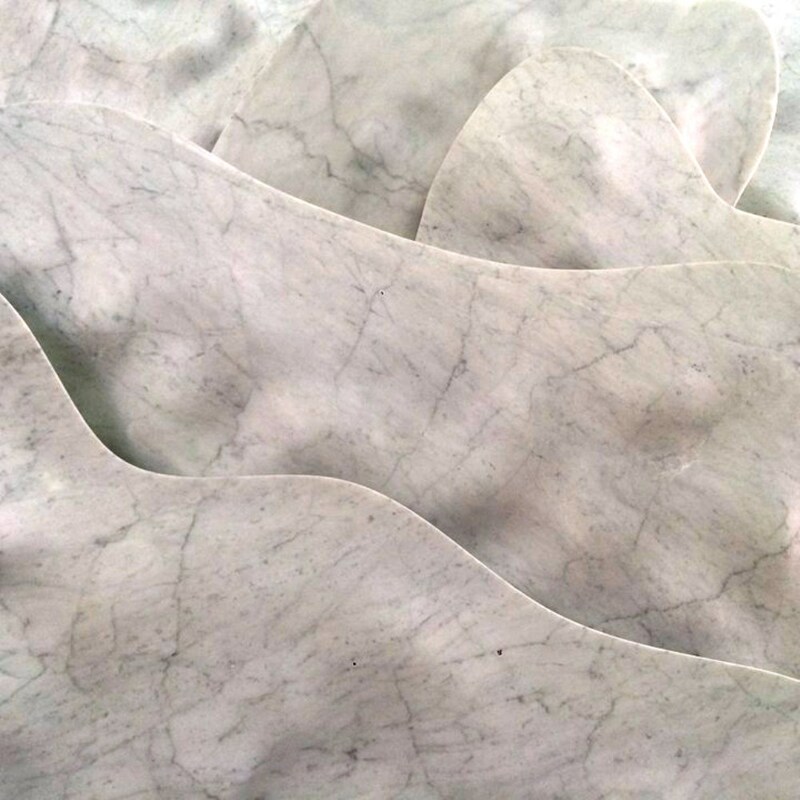 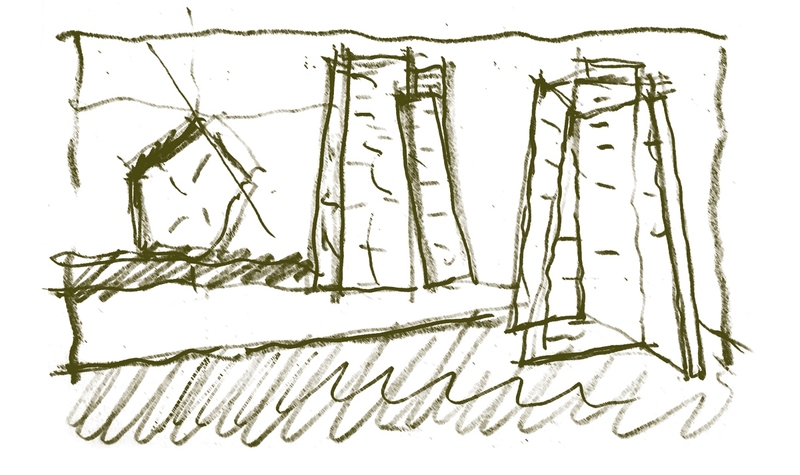 In particular, the focus of her study and design is the processing of what, in the jargon of Quarriers, is commonly called “hairline” fractures of the mountain” (“pelo del monte”). 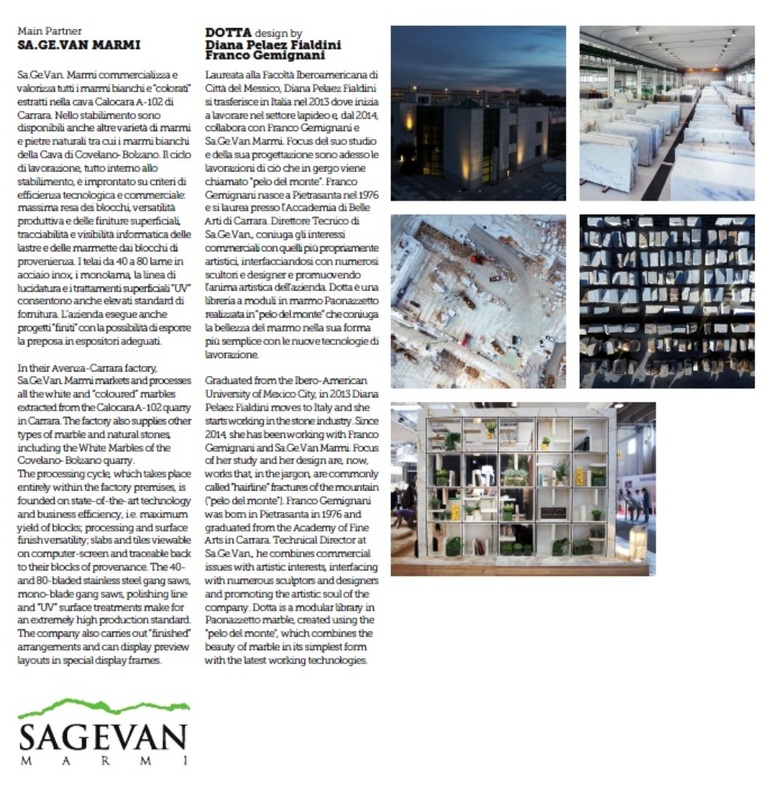 Sa.Ge.Van. 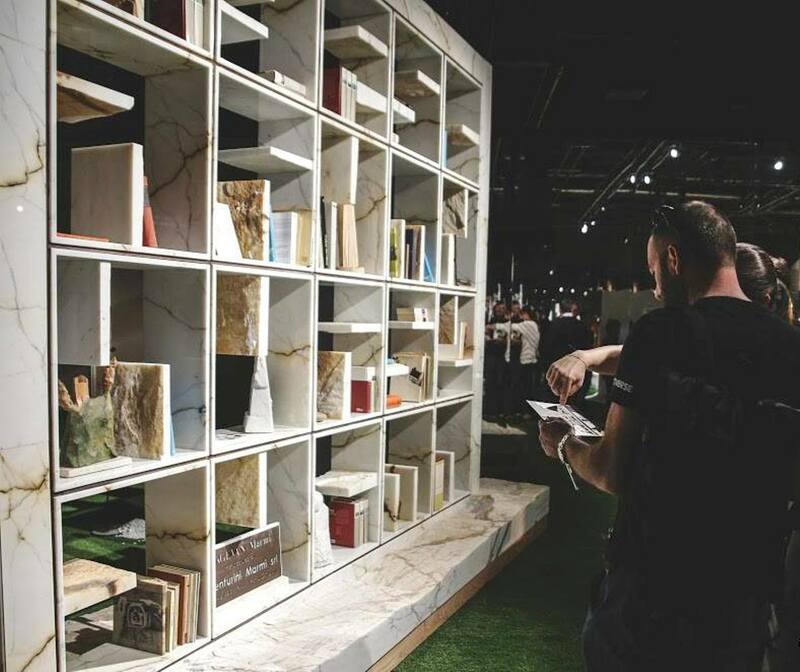 Marmi presented DOTTA : a bookcase made of marble paonazzetto marble. 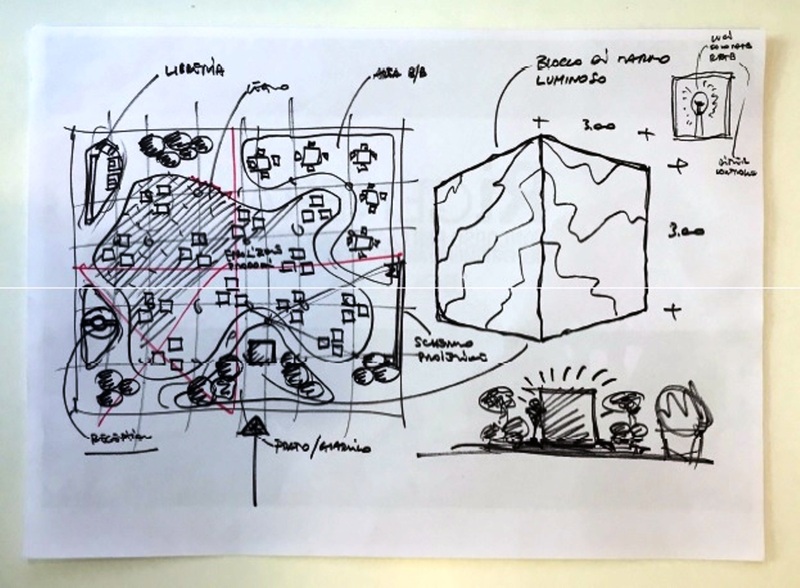 Its added value is also in the use of the material chosen: the “waste” of the mountain, with the idea of ​​enabling a waste element to make it a unique design object, accessible every day. 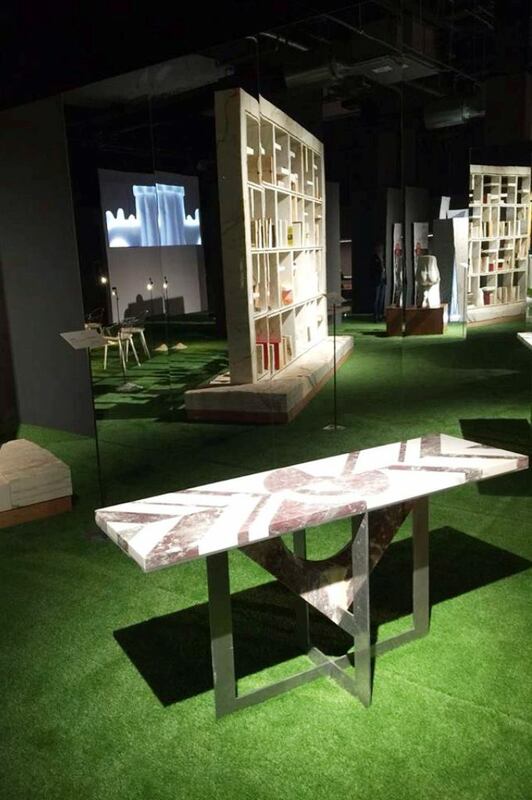 Free-standing, linear and sober, Dotta combines the beauty of marble in its most basic form with new processing technologies. 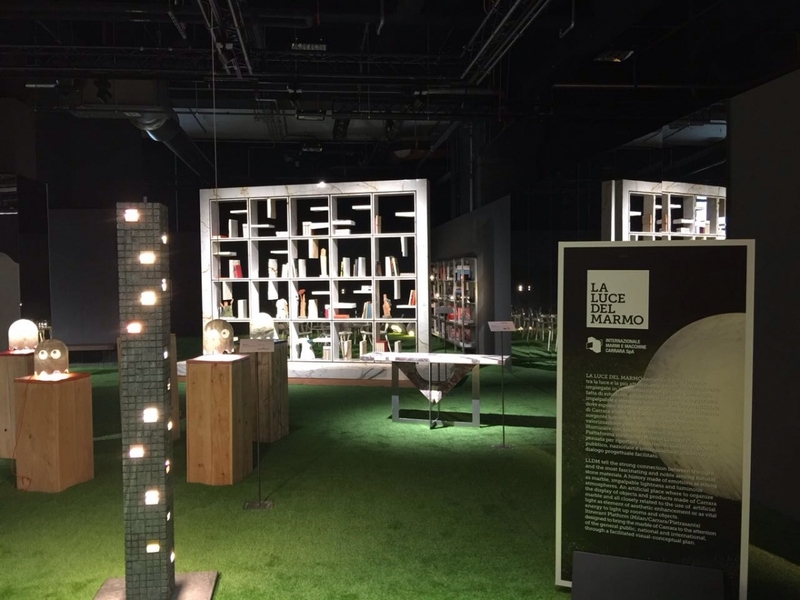 The wish to create an object with a unique design through waste material represents a further added value to the project. 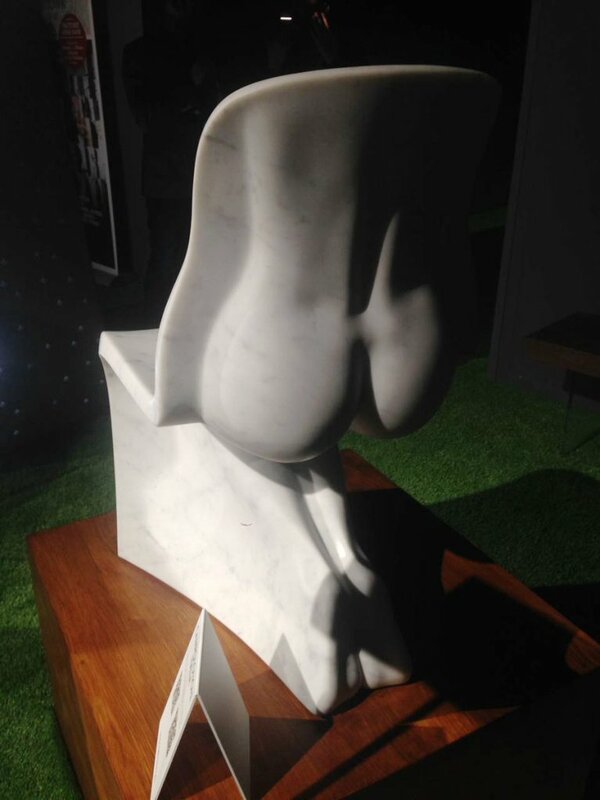 Marmi Carrara entrusted to Chicco Chiari, an artist renowned for the marvelous Carrara marble sculptures that resemble the icons of his youth. 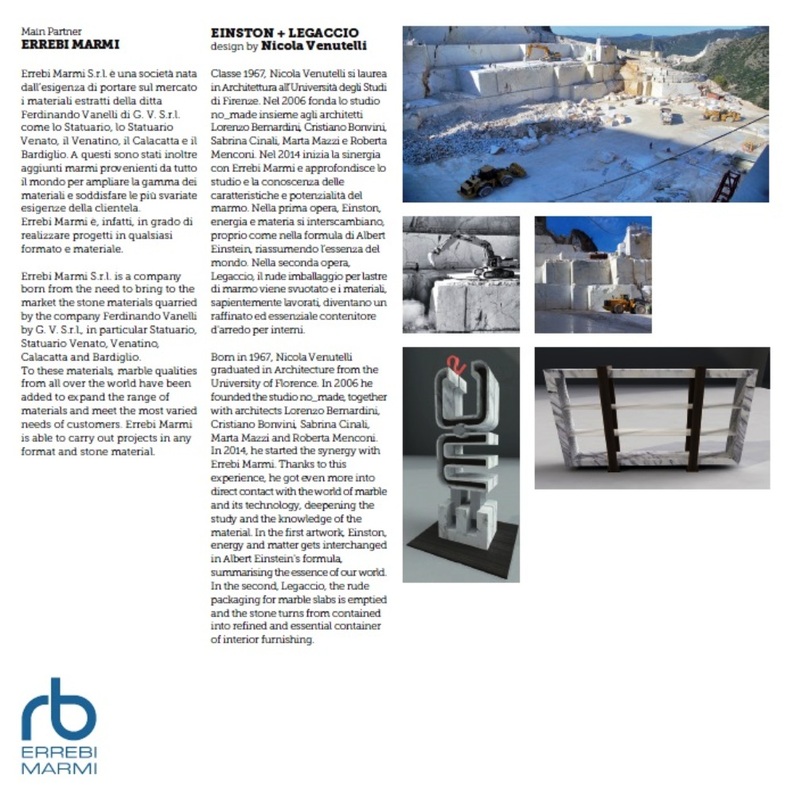 Marmi Carrara is the largest company in the stone sector of the Apulian-Versilia region, with 50% of the production of the marble quarries of Gioia, Canalgrande, Lorano, Belgio and Campanile. 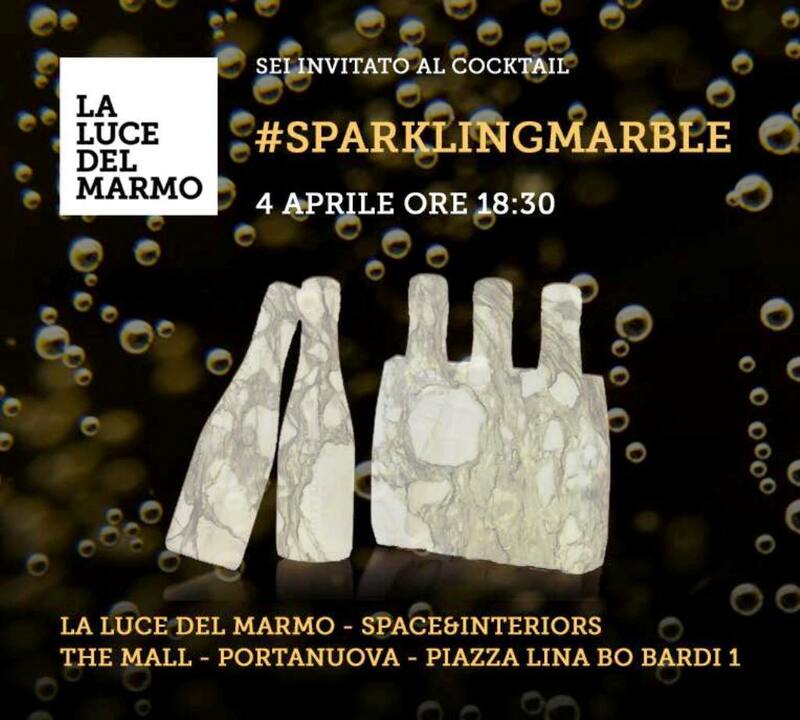 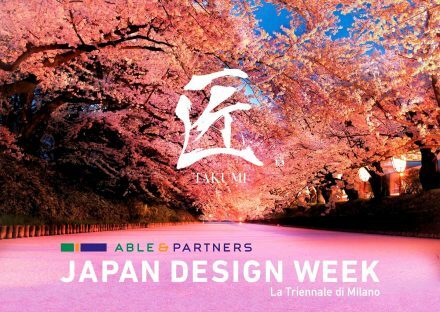 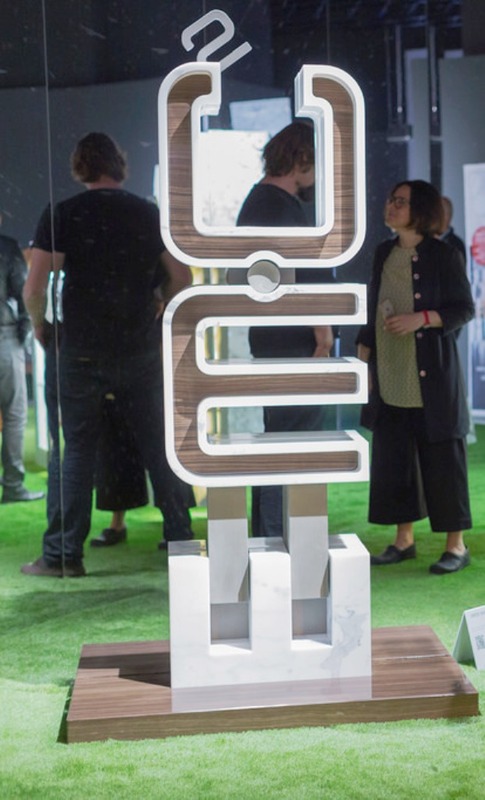 “ We firmly believe that every instrument aimed at promoting marble in all its aspects and uses is always valid and productive and the Fuorisalone certainly represents one of the most prestigious showcases attended by the best audience that every entrepreneur can hope for. 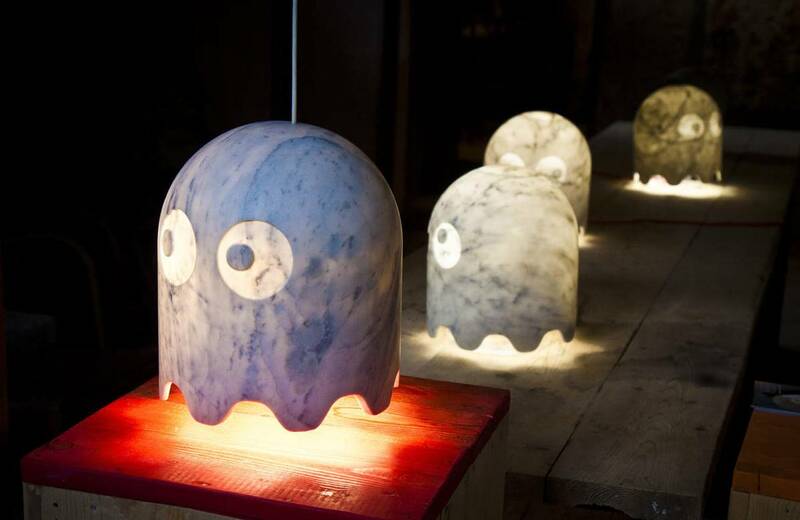 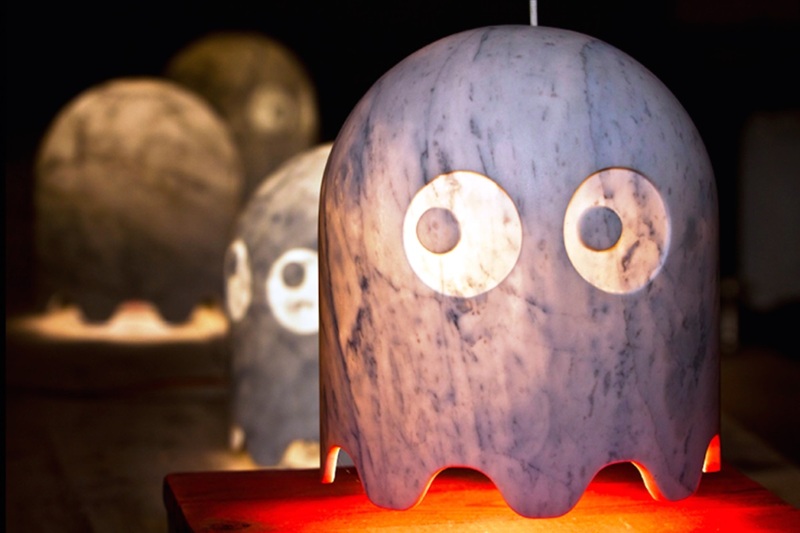 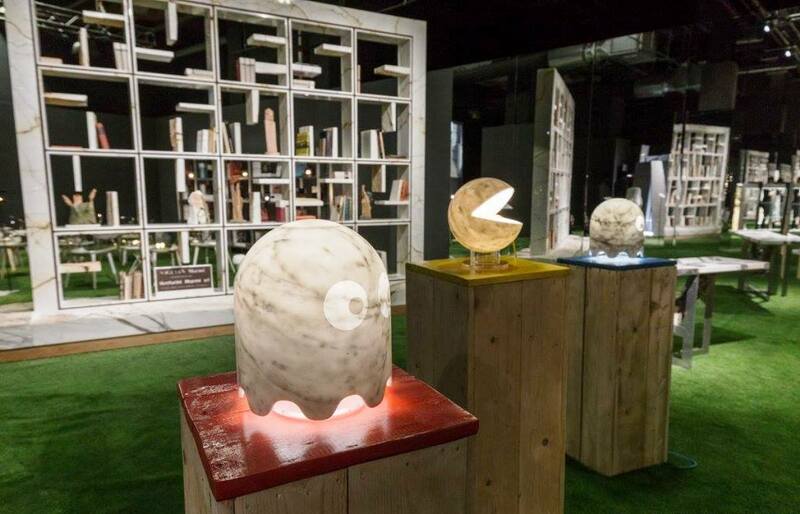 His work, Memories from the Future featured luminescent “ghosts”, inspired by the famous Pacman video game, made of Carrara or Statuary white marble. 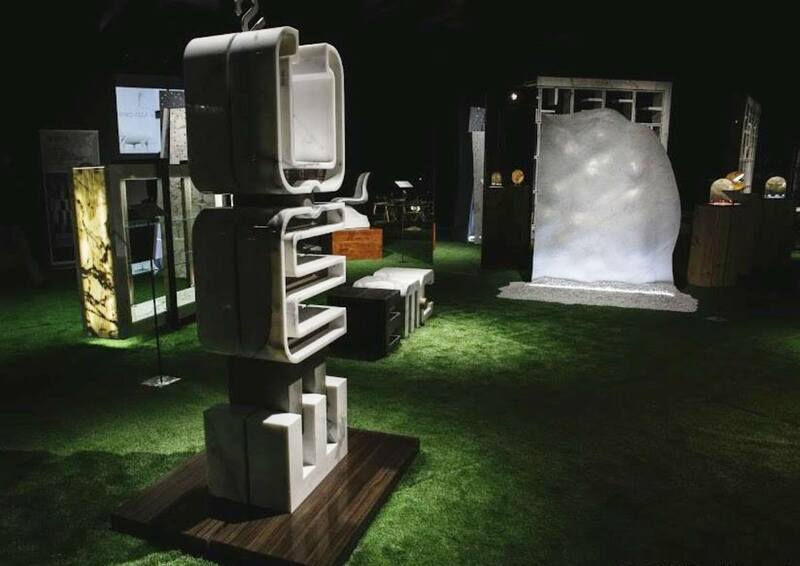 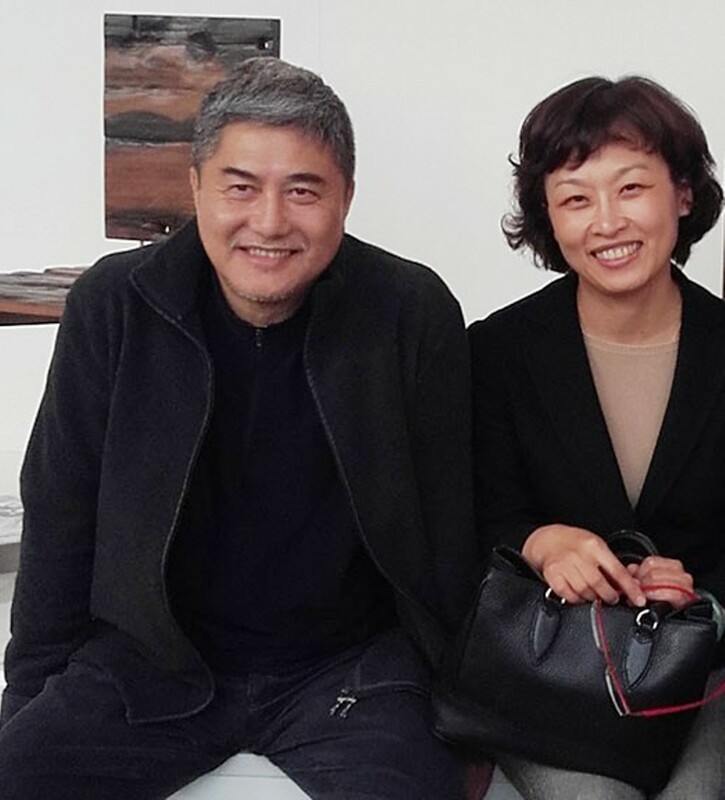 Chen Xiangjing, pioneer of the modern Chinese interior design school, is considered among the 10 best designers in the Asian continent, designed the work for GMC Spa. 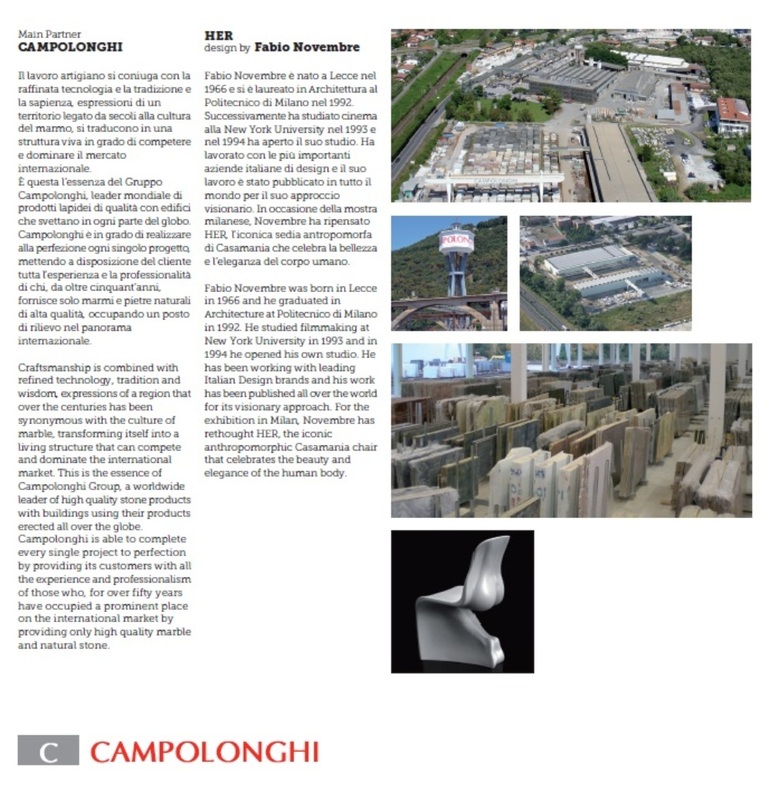 The company has been working in the marble and granite sector since 1973. 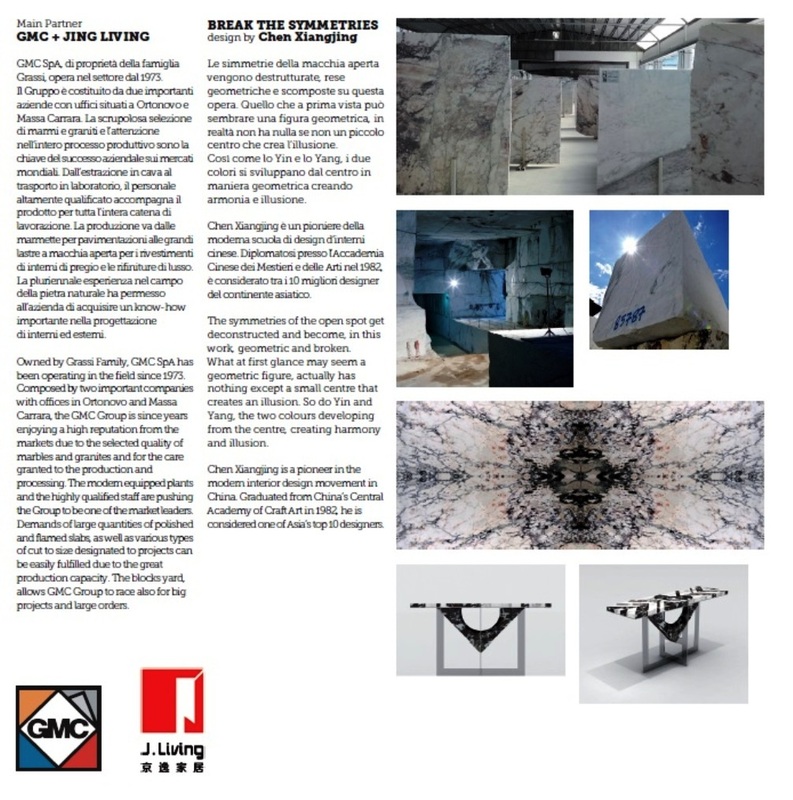 GMC’s scrupulous selection of marble and Granites and attention in the entire production process are the key to its’ business success on world markets. 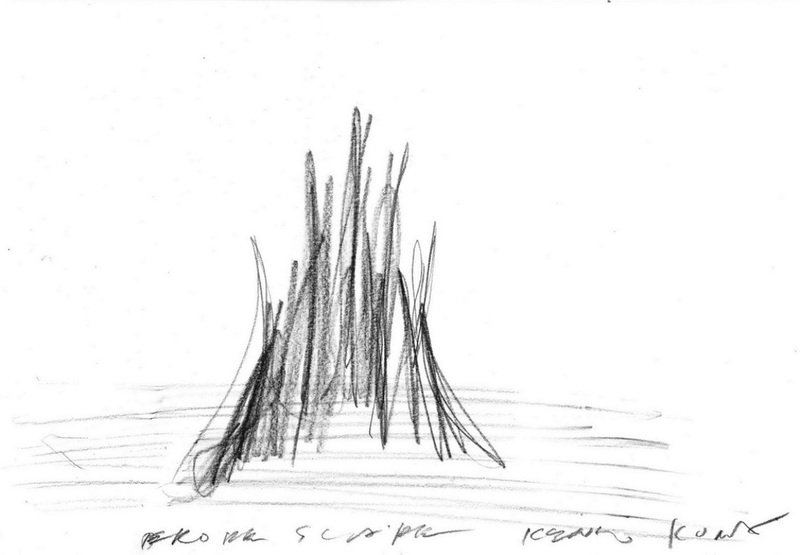 Break the Symmetries: The symmetries of the open scrub are disrupted, rendered geometric and decomposed on this work. 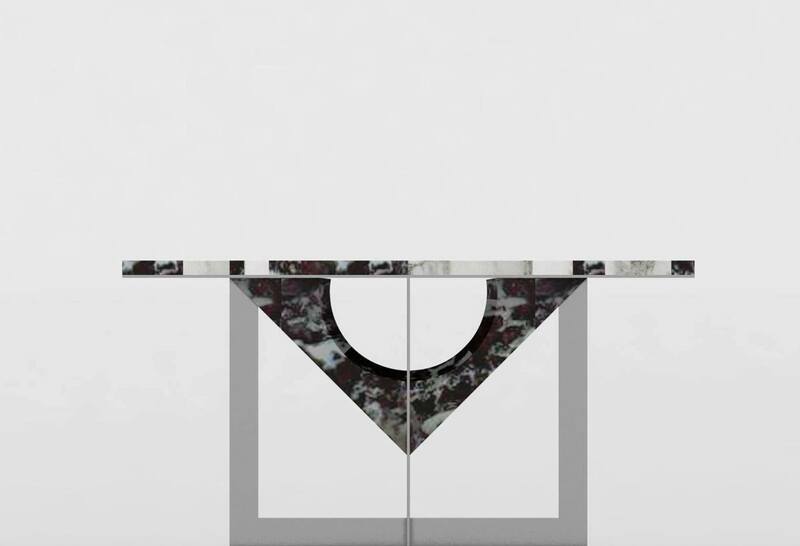 What at first glance can seem like a geometric figure, it actually has nothing but a small center that creates the illusion. 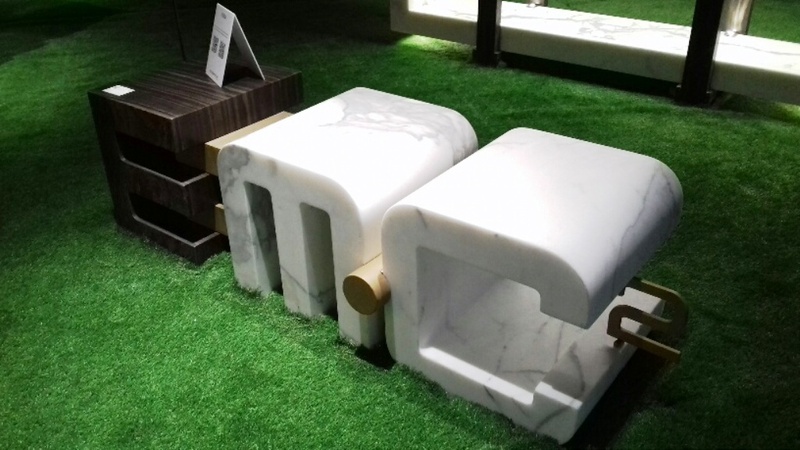 Just like Ying and Yang, the two colors develop from the center geometrically creating harmony and illusion.